DEMOCRACY DEFINED Campaign Material. Jury Nullification Flier, Pamphlets, Essays and Posters. 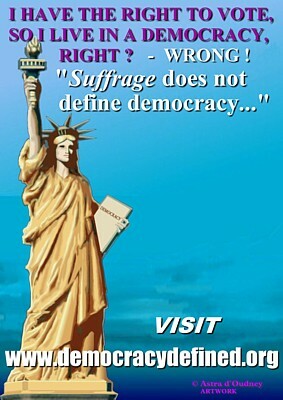 The Democracy Defined not-for-profit Educational Campaign. 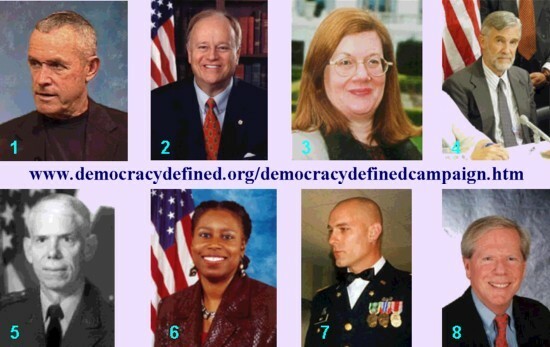 The Democracy Defined Campaign Philosophy is supported by people from all walks of life, including academics, doctors, attorneys and judges (U.S. & U.K.). Join in the Campaign by downloading and distributing the free educational pamphlets, essays and posters below. You can do this one at a time and keep distributing the info and posters regularly. Contact us by e-mail today for free Membership, your Member’s Card and privileges - click on button above. Download pamphlets to print out, photocopy, staple together and give to family, friends, colleagues at work and school, and to media. DEMOCRACY DEFINED: The Manifesto ISBN 9781902848266. The contents of DEMOCRACY DEFINED: The Manifesto are enriched by the fascinating quoted wisdom and words of great minds - Churchill, Gibbon, Hale, Hallam, Hume, Blackstone, Crabbe, Millar, Mackintosh, Gilbert, Palgrave, Coke et al., chief justices, judges, Benjamin Franklin, Presidents Kennedy, Roosevelt, Adams, Jefferson, Madison, Washington, Lincoln. This extensively researched book is enlightening - it reveals in irrefutable detail how far the modern political establishment and justice system have strayed from the prescribed lawful modus operandi. them to be copied intact and unaltered, and freely distributed. "I have read your campaign material on your website. This is a message that should be presented and your organisation and website are doing a fine job of sharing this with the world. The website thoughts on constitutional government are well presented and timely. Keep up the good work!" LEON MOYER, State Contact, Jury Rights Activist, Colorado, U.S.A. 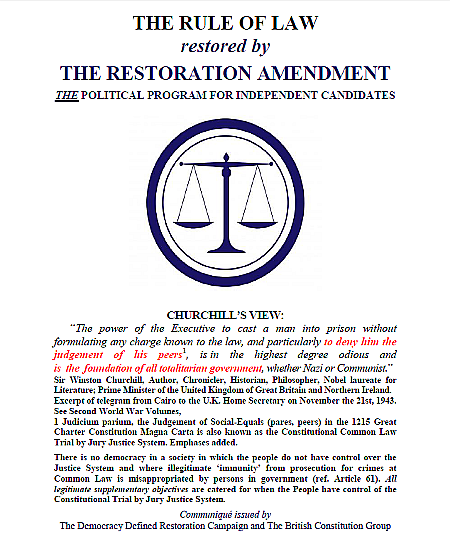 The economics of the Democracy Defined Restoration Program offers to REMAINERS a spectacular incentive to become BREXITERS - you will see that when you read the PDFs provided. We must not allow Theresa, Boris, Nigel and MPs to continue to dodge the issue. HIS HON. JUSTICE PATRICK S.J. CARMACK, Esq. Producer, The Money Masters video documentary. Other reviews are shown in the text. Excerpt from DEMOCRACY DEFINED: The Manifesto ISBN 978-1-902848-26-6. KENN D'OUDNEY, Campaign Coordinator, Democracy Defined Restoration Campaign. We, who are sovereign and who are gathered here today in the ancient capital of King Alfred the Great, on this day of the Nineteenth of November, 2016, do now serve notice to our elected servants and representatives in Parliament that we require the Rule of Law to be fully restored to the British people with immediate effect by their passing of The Restoration Amendment. So today, at Winchester, we do serve notice to our elected servants in Parliament, and to those residing in the corridors of power, that if you do not now actively support The Restoration Amendment to restore fully the Rule of Law in our country, and you persist in your treasonous ways with your malfeasance in public office, that we are compelled by the Common and God-given Law of this country to take whatever appropriate and peaceful steps that are needed to bring you to justice. This is a pledge that we take willingly today that cannot be lawfully broken. The Rule of Law will be restored to our nation! 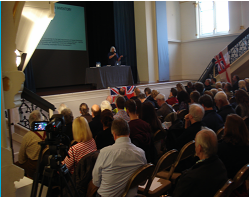 JUSTIN WALKER, Campaign Coordinator, British Constitution Group & New Chartist Movement. 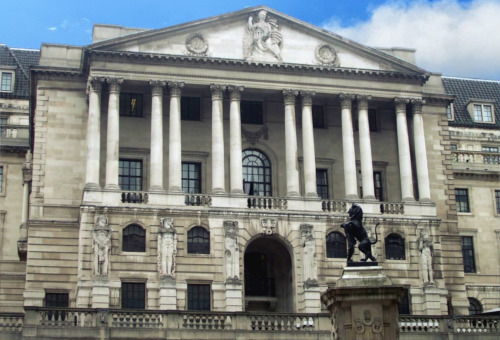 WHO REALLY OWNS THE BANK OF ENGLAND? An Essay by Kenn d'Oudney. THE BILL IS UNCONSTITUTIONAL, REPUGNANT AND VOID. In order to come to an appreciation of the ways in which the 1688 Bill of Rights is constitutionally repugnant and void, it is first necessary to know and understand the purpose and workings of those supreme, indispensable definitive elements of the English (cf. British) Common Law Constitution which the Bill contravenes. These contents are itemised and the specific infringements by the Bill are explained in the text. 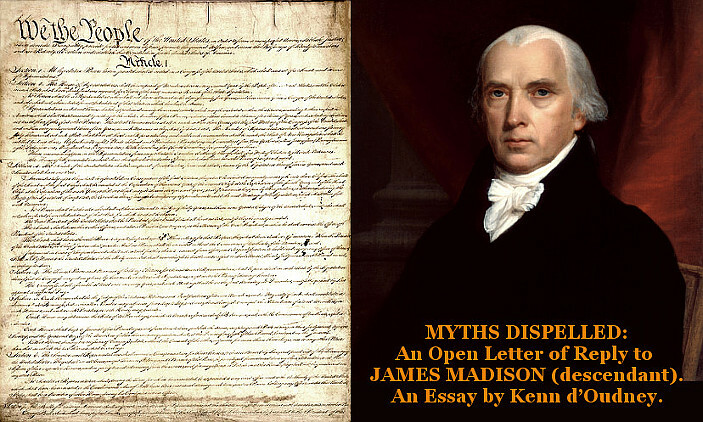 OPEN LETTER TO "UNLAWFUL REBELS"
In one of many unforgivable acts of mens rea (i.e., criminal malice aforethought), traitors within our government, lawyers and politicians, coin and employ an untruthful slogan, “lawful rebellion,” to denigrate our Constitution. This is because they are aware that the Constitution’s Articles 24, 36, 39, 40 and 61 oblige all citizens to uphold the Constitution’s Rule of Law and prosecute them for their anti-constitutional activities. Ignorant of the workings and contents of the Constitution, dupes and various groups pick up and use the derogatory cant "lawful rebellion." This text explains why upholding the strictures of the 1215 Great Charter British Constitution Magna Carta is never "lawful rebellion." Campaigners! Beware wasting resources, energy and time promulgating Article 61! - Focus instead on educating people as to how passage of The Restoration Amendment restores the widespread prosperity of the Common Law Economy, precluding the present concomitant taxation and council tax upon the people through issuance of interest-free state money, currency, coin and credit, and retroactive Recriminalisation of Usury dissolving the ‘National Debt’. So, let us Campaign and recruit members to the previously mentioned Restoration Campaign Organisations. An Essay by Kenn d’Oudney. Treachery is behaviour repeated down the centuries. 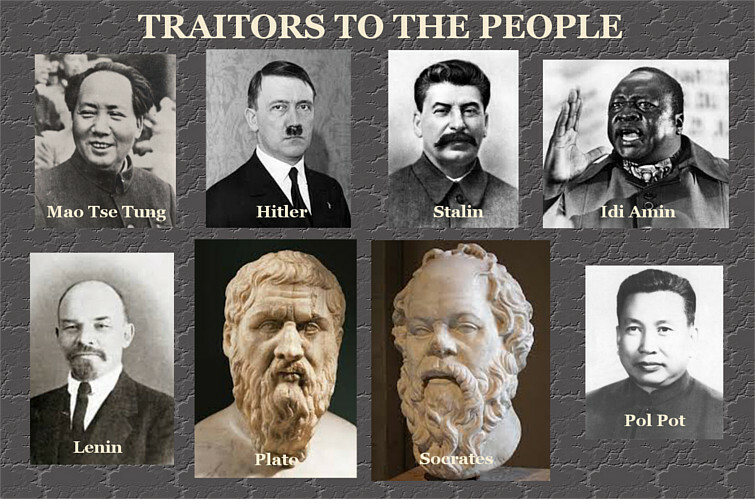 This essay compares the Original Traitors to Democracy to those in parliament and congress today. Clarification is especially pertinent at this time when the treasonous claim of "parlimentary sovereignty" is all too often heard -- the People, not parliament, are sovereign. This short extract derives from the words and wisdom of our great historical, legal, constitutional opuses by Gibbon, Palgrave, Millar, Gilbert, Hale, Crabbe, Hallam, Spooner, Coke, Blackstone, Mackintosh, de Thoyras, Stephens, Hume, Jefferson, Madison, Franklin, Wilson (Justice James), Macaulay et al. 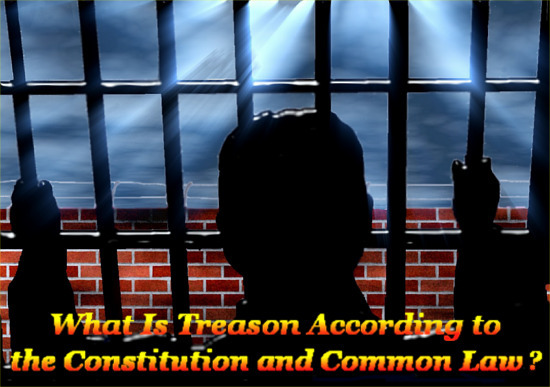 Treason to our Constitution and at Common Law is explained in this pdf. It is uncomplicated, but, as you would expect, it is very different from the self-interested notions of ‘treason’ propagated by monarchs and parliamentary despots and inserted into their statutes. Open Letter of Reply to Charles Vickers, EDP. the basis of the U.S., Australian, Canadian and other constitutions! "Your rebuttal is masterly. Your essay is a very good read." Founded by John Gouriet and the Viscount de L'Isle, VC, KG, PC; Ross McWhirter and Norris McWhirter, CBE. Did you know Article Thirty-Nine of our world-respected permanent 1215 Great Charter Constitution Magna Carta transfers all power to punish out of the hands of government, the executive, the legislature and the judiciary? Yes; our protective Constitution strips the state, the government and judges of all power to set sentences and prescribe punishments. This is the single most significant protective aspect of Trial by Jury defined and prescribed by the virtually immutable 1215 Magna Carta Constitution and Common Law. Inimical government and its highly-remunerated unconscionable Quisling collaborators lie to deny our exemplary 1215 Constitution and effectively enslave the English People. Magna Carta is written in Latin. Are you aware of the treason embodied in the trick of mistranslation which mendacious statists utilise today to try to deny the applicability of Constitutional Common Law Article Thirty-Nine? See the following essay which exposes the treachery. To Westminster College, Fulton, Missouri, 1946. Reading the Essay, one comes to perceive how intrusive modern governments everywhere can be kept peacefully under control and within the bounds of civilised behaviour. "What a magnificent article! I intend to incorporate parts of it into my speeches and writings." 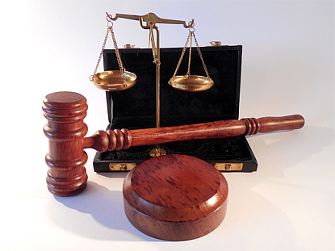 WHY IS TRIAL BY JURY IMPORTANT? are passing around and distributing these EIS pamphlets all over the world. ON REFERENDA AND MAJORITY RULE. This essay comprises part of the contents of a book published by SRC Publishing. It is nevertheless, for the time being anyway, downloadable for free. 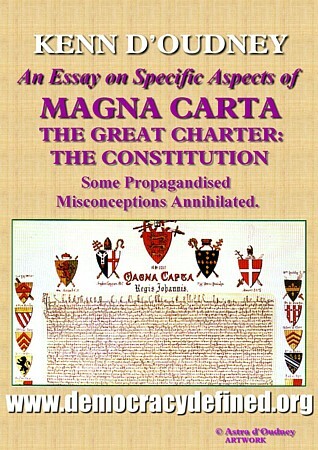 The English Constitution’s authors and our forefathers, common and ennobled, knew, understood, defined and prescribed within the world-respected 1215 Great Charter Constitution Magna Carta, the sole peaceful means known to mankind for annihilating tyranny and establishing Equal Justice for All. 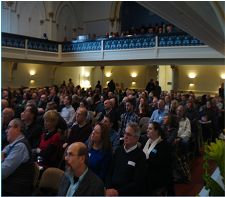 The Winchester Declaration Conference, BCG, Winchester Guildhall. 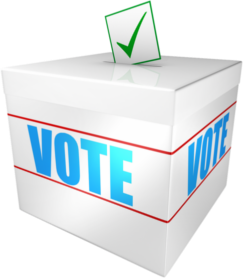 In the course of this campaign, the BCG will be hosting a Candidate Fund for contributions to help people get elected to Parliament as Independent Candidates on the DD / BCG Program. The commencement of this fund will be announced in due course. For the common good of all, it is essential that this unique Campaign Message gets out to the greatest mass of folk especially at this time when the treasonous claim of "parlimentary sovereignty" is all too often heard. 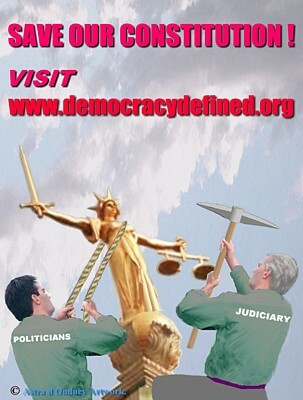 When our folk realise that at Common Law and Constitution, the People, not parliament, are sovereign, then people can make informed choices: social and financial circumstances for all our people can be exponentially ameliorated; the Illegality of the Status Quo can be understood and rectified; Liberty and Equal Justice through the authentic Constitutional Trial by Jury will be restored. If those factors are important to you and especially if you voted for BREXIT, then this is the Campaign for you. However, the economics of the Restoration Program also offers to REMAINERS a spectacular incentive to become BREXITERS - you will see that when you read the PDFs provided; see above. There is an historic opportunity not to be missed following Brexit. To achieve it, ‘We the People’ have to acquire our own elected Independent Representatives. Why? Because, the established leaders of both the Brexit and Remain campaigns and all the political parties refuse to debate the main economic issue of our time. And what is this “main economic issue”? It is that the usurious, fraudulent debt-based globalist currency system which impoverishes and enfetters all of us, is intended to hold sway in Britain whether or not we extricate ourselves from the EU and whoever wins the next general election. There is the ALTERNATIVE which is central to the DD / BCG Restoration Program. BREXITERS and those loyal to Common Law values will bring social justice to economics by the re-introduction of STATE MONEY (Sovereign National Credit). At present, privately-owned banks issue currency and credit through the Bank of England into the economy at interest (the Common Law Crime of Usury), of which the capital and interest has to be repaid by taxing the populace. This is the source of our bogus "national debt." Instead, sovereign national credit is the issuance by the government (Treasury) of interest-free currency and credit into the national economy (as, for example, by Presidents Jefferson, Madison and Jackson, or Lincoln’s ‘greenbacks’, Franklin’s Colonial Scrip, and in 1914, the UK’s £300 million issuance of the ‘Bradbury Pound’; see leaflet). With your help, we can propagate the DD / BCG Restoration of the Rule of Law Program so that it reaches the hearts and minds of hundreds of thousands, no millions, of our folk, including all those who voted for Brexit. For the good of all, we want our pamphlets read and understood in all the thirteen million households of England. 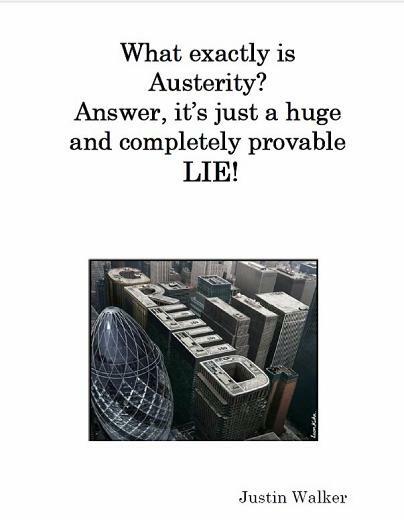 This pamphlet should be copied and distributed to people from all walks of life: students, teachers and lecturers, doctors and nurses, blue and white-collar workers, editors, reporters and presenters, servicemen and women, policemen and women - everyone from youngsters to pensioners. Can we achieve that? 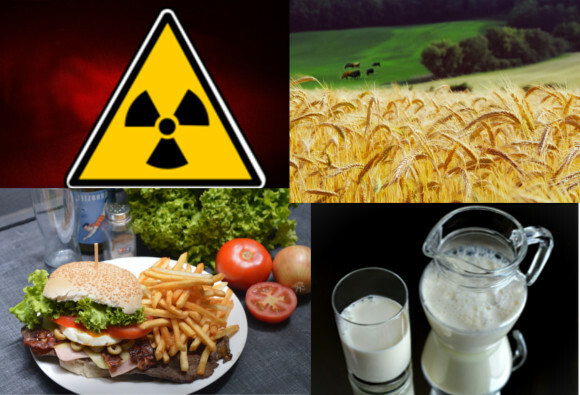 PHOSPHATE ‘FERTILISER’ IS THE PRINCIPAL CAUSE OF CANCER. This essay is based on information in Part One (of the seven parts) of THE REPORT ISBN 9781902848211 by Kenn d'Oudney and Joanna d'Oudney. Through diligent research, Justin Walker, Campaign Coordinator of the British Constitution Group, has brought to public attention another example of the issuance of usury-free currency: the £300 million worth of ‘Bradbury pound’ banknotes. These were issued interest-free by the U.K. National Treasury to prevent a run on the banks at the outbreak of the First World War. The banknotes (cash money) are so-named because they were undersigned by Secretary to the Treasury, Sir John Bradbury. As Justin Walker’s e-book concentrates on the Bradbury Pound and Fractional Reserve Lending, we recommend in conjunction with his e-book, downloading “What the Leaders of Brexit (and Remain) Aren’t Telling You” as complementary reading. For reasons explained below, these two PDFs should be perused together. The issuance of interest-free currency and credit to the national economy through a government treasury department (i.e., not sourced from privately-owned banks) is a Constitutional duty both in the U.K and the U.S. It is exemplified by the actions of Presidents Jefferson, Madison and Jackson, Abraham Lincoln’s ‘greenbacks’, and Benjamin Franklin’s Colonial Scrip. While learning about pernicious Usury and Fractional Reserve Lending, it is indispensable for serious campaigners also to know the solution to these problems. Fractional Reserve Lending (de facto fraud) by private banks and Usury are Crimes at Common Law and are recognised as such by our Constitution. These straightforward but crucial legal, financial, fiscal and Common Law facets need to be well understood so that patriots and Independent Candidates for election to parliament have the facts with which to campaign and achieve parliamentary rectification of the Illegality of the Status Quo through enactment of The Restoration Amendment. It is indispensable to know and be able to explain what power it is with which the people are bestowed by their 1215 Great Charter Constitution’s Trial by Jury -- i.e., the cost-free power for single or multiple private plaintiffs to arraign individual (commoner) politicians, judges and bankers for their crimes before a Common Law Trial by a Jury of 'ordinary' citizens. This embodies the sole (peaceful) means by which the People may take it upon themselves to restore our Culture to due prominence once more; for the People to take back their natural egalitarian sovereignty and secular common law courts; to enjoy the fruits of national issuance of interest-free currency and credit, free of government indebtment and free from concomitant compulsory taxation; and to re-secure unto themselves legal Constitutional control of the Wealth of the Nation; their rightful due inheritance. The facts are explained in the PDF “What the Leaders of Brexit (and Remain) Aren’t Telling You” which is comprised of extracts from the textbook DEMOCRACY DEFINED: The Manifesto. 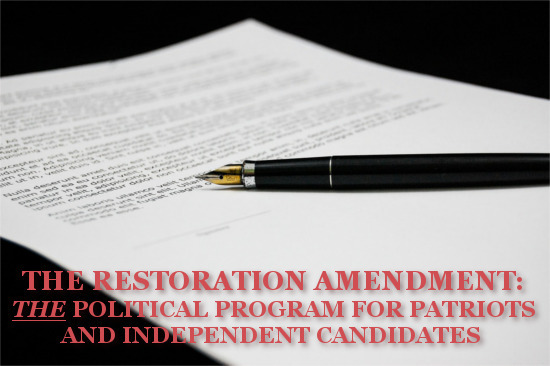 You may also refer to THE RESTORATION AMENDMENT in the new edition. What is the 9-11 Truth movement ? and why are hundreds of ex-government, military, CIA, FBI and qualified professionals and academics joining the Truth Movement ? It is the evidence revealing the truth of what really happened on 9-11 which compels patriots and good people everywhere to join the Truth Movement. (For all photos and full text below about the 9-11 event , please ensure you are browsing on the desktop version of this website, not the mobile version). A Selection of Patriots for 9-11 Truth. 1. Lt. Col. Shelton F. Lankford, U.S. Marine Corps (ret) - Retired U.S. Marine Corps fighter pilot with over 300 combat missions flown. 21-year Marine Corps career. 2. Senator Max Cleland. 3. Barbara Honegger, MS White House Policy Analyst and Special Assistant to President Ronald Reagan (1981 - 1983). 4. Raymond L. McGovern - Former Chairman, National Intelligence Estimates, CIA, responsible for preparing the President's Daily Brief (PDB) for Ronald Reagan. 5. Major General Albert Stubblebine, U.S. Army (ret). 6. Congresswoman Cynthia McKinney. 7. Capt. Eric H. May, U.S. Army (ret). 8. Paul Craig Roberts, PhD - Assistant Secretary of the U.S. Treasury under Ronald Reagan, who came to be known as the "Father of Reaganomics." Architects & Engineers for 9/11 Truth. Why are architects and engineers re-examining the WTC Collapses ? The years since the 11th of September, 2001, have given time for people to emerge from the trance caused by the shocks of the attacks, and rationally evaluate the evidence. Listen to Richard Gage's fascinating lecture from the expert architect's viewpoint, about the machinations required to have brought about the controlled demolition of the three skyscrapers of the World Trade Center. Architects, engineers, and everyone else ! -- go to AE911Truth.org and sign the online petition for an independent investigation. The kerosene jetfuel from the plane impact had long since been consumed. Only rugs, curtains and desks were burning, incapable of melting or even softening the steel cores. Black smoke indicated an oxygen-starved dying fire. Looking like matchsticks at a distance, are steel beams weighing thousands of pounds being hurled horizontally for hundreds of feet. Only explosives could impart this lateral energy. Note: WTC Building 7 was 610 feet tall, 47 stories, and was not hit by an aeroplane. It was the tallest building in 33 states. However, no mention of its collapse appears in the 9/11 Commission's "full and complete account of the circumstances surrounding the September 11, 2001 terrorist (sic) attacks." Watch the video of its demolition in 6 and a half seconds at free-fall speed. Fifteen years after 9/11, the federal government has yet to publish its promised final report that explains the cause of its collapse. The Twin Towers: Forty-seven mighty core columns of solid steel easily bore the load. 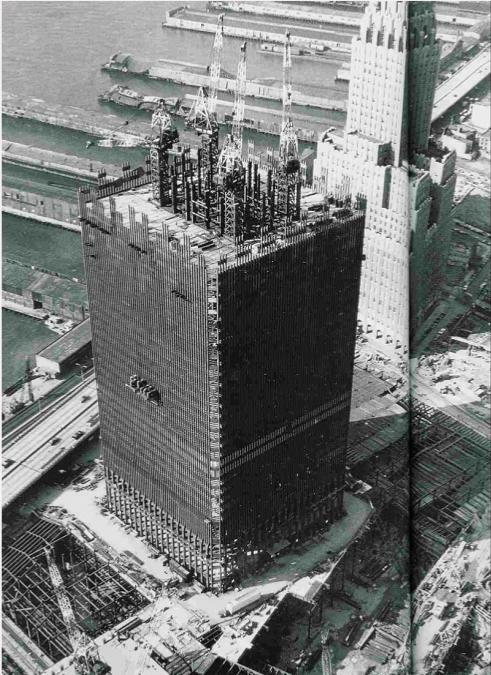 The elevator shafts were within this core structure; the steel-reinforced concrete floors surrounded it. Look at the steel cores of the Tower under construction. Thermite and thermate are specialist steel-cutting demolition explosives which detonate fast at very high temperatures. They are utilised in controlled demolitions for cutting the steel support structures within modern high-rise buildings. 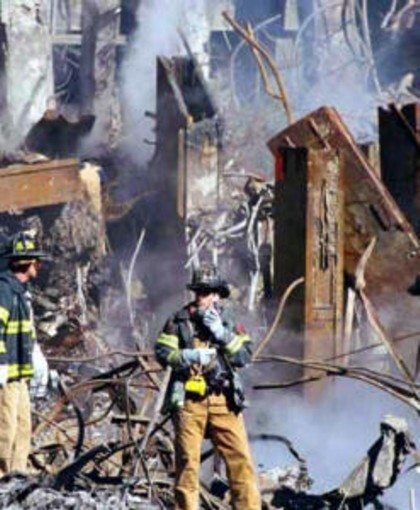 Notice the melted edge of the huge steel core beams 'cut' by weapons' grade ultra-modern nano-thermite explosive which was confirmed present in pulverised concrete dust from ground zero. Observe the beams cut to convenient lengths for transport. This is standard demolition procedure. It is worth pointing out to people that there is much to fear that will follow if the culprits continue to get away with their high crime with impunity. Do your part to see justice is done. The recalcitrance of the owned and controlled media to report truthfully on this dark episode of our (Western) history means that good citizens who pursue truth and justice realise that it is their absolute duty to inform others. Everyone has a right to know about matters which concern their lives. Feel free to forward this COMPENDIUM to schools' staff, university students and lecturers, personnel at offices, factories, shops and hospitals, members of the armed forces and police, local and national politicians, media, local and national, friends, family and everyone you know. Download this Compendium which serves as an introduction to the subject, and as a source of additional references for those already familiar with the 9/11 Truth Movement.